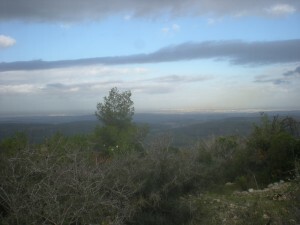 Overlooking the Shefela (Lowlands) from Beit Meir on a cloudy day. We had our first siyur (tour) this past Tuesday. Entitled “In the Footsteps of David and Shimshon (Samson),” it really encompassed a few different subjects that all related to the area around the city of Beit Shemesh. We also spent some time at the beginning of the day in moshav Beit Meir, at the very end tip of one of the ridges of the Judean Hills. This gave us the chance to get a good overview of the geography of the land (though it would have been a much better view if the day was sunnier, rather than alternately cloudy and rainy, with only brief respites of sunshine).